UPDATE: THIS BLOG POST IS A TOTAL MISTAKE. FRANCE IS NOT BLOCKING FOREIGN VOIP PROVIDERS. 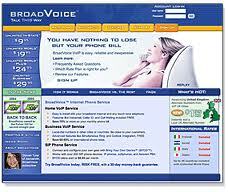 ACTUALLY, IT IS BROADVOICE THAT IS BLOCKING FOREIGN IP ADDRESSES. MY APOLOGIES. FEEL FREE TO CRITICIZE. I AM NOT REMOVING THIS POST IN THE SPIRIT OF ABSURDITY. It looks like all foreign VoIP services are blocked by all ISPs in France (I didn't have the opportunity to run a test from a "Free" DSL connection though). Same results so far with Orange DSL, Numericable & Bouygues Cellular. Connecting through a VPN works so it can only be the result of a voluntary action. This is a very sad and definitely terrifying news for those of us that subscribe to a U.S. based VoIP service in order for their American friends & family to reach them on a U.S. phone number. Can you publish something serious about that topic ? My apologies. You are right. I've just updated this post. Good thinking. Thanks for sharing this with us. Great post. My friend was telling me about VoIP so I have been looking up VoIP providers all morning. Thanks so much for sharing. I am looking for reliable Voip Providers offers free and cheap phone calls over the internet.Can anyone suggest me something? This is an interesting..... great information found here... Thanks very much! I was communicating with my friend through Voip, he is in France and using PureVPN software to unblocking this issue.. he said that its very easy to unblock websites and communication ways like Voip through VPN.. he bought France VPN server from here..